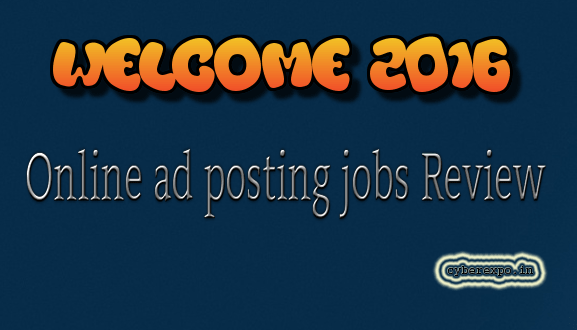 Online ad posting jobs Review 2016 How to earn money? Online Ad Posting Jobs Review 2016 – How Much Money I Can Earn Here? Very beginning Question , why online jobs instead of offline jobs? As per our experience getting a work from home jobs that can be worked online is far better than offline jobs, Yes! we got your point that “For doing any offline jobs you don’t need to have any fast internet connection or fast PC” , but as most of the offline jobs is not secure and untrusted. So better to pay some more for getting internet connection and work online, Internet keeps you up to date with all latest trend and you will able to read all reviews about online jobs. Hence we found that most of offline jobs is boring typing work and for getting payment you need to wait for 30 days , this is too much wait time but while you are sing in for daily work daily payment ad posting job you will be paid regular basis. Interested? Read: How CYBER EXPO make daily work daily payment to their members? What is the jobs profile for Online ad posting jobs? You might be very interested to know how actually the jobs called Online ad posting jobs! Well it’s a classified advertising jobs where you need to view classified websites one by one and post service or business related ads as per instruction. Whenever you post ad into any classified ads its seem to marked 1 successful ad posting. As many as you will post , by counting them you will get paid daily (Per ad posting rates may be- Rs-4/- to Rs-10/- Check plan and pricing) It’s an amazing jobs you should try if you are really searching for read online jobs! Why is not a scam? While doing any work from jobs the first question will be is it a scam? Well this are the best point that make you trustable that online ad posting jobs in CYBER EXPO is not a scam! Its Realistic jobs: Most of the online has no reality , there is no business concept to other way to cross earning from their member works , but in Online ad posting jobs you have the reason to earn money because of your ad posting jobs provider company also earning from your posting. CYBER EXPO is An ISO 9001: 2008 Certified and additionally you will be Provide an Agreement Paper with Two Party Signature. Sing up with Risk-Free Court Paper Agreement: on the same day of your joining, we will dispatch the hard copy of your agreement paper into your Postal address. You can check the consignment status from India Post websites using your Tracking ID. Free affiliate Marketing account: It’s like buy one get one free as soon as you are sing in into CYBER EXPO online ad posting jobs , you are able to create a new free affiliate account that’s brings you some extra income with your regular ad posting jobs. Daily payment: We make you wait not too long for your ad posting jobs , work daily and send your report on or before 09:30 am every day to get payment regularly. How much money I can earn here? It’s a freelancer Jobs , so your earning is depending on your work prefer time and skills , hence you can check out the standard plan and pricing for our ad posting jobs. Requirement for doing Online ad posting jobs? Some quick tips that make you faster while doing Online ad posting jobs! Do you know you can use ad posting software to work faster and more reliable way. Check this out how you can double or triple your ad posting earning by using ad posting software. Let me know how you are going to spend your 2016 , make comment if you are interested to earn money by doing online ad posting jobs!